Groundbreaking graduates are moving through the ranks at Komatsu’s factory in Tyne & Wear. Stuart Tomlinson, 27, and Maria Dimova, 28, both recently gained promotions to Senior Quality Engineer and Senior Production Engineer respectively, at the Birtley plant, having progressed rapidly since being recruited fresh from university. Stuart, who joined the firm directly from Newcastle University’s Mechanical Engineering Degree, puts his rapid progress down to the variety of roles within the business, as well as its focus on continuous improvement. Stuart said: “Engineering is such an interesting profession, but at Komastu it’s so varied and interesting because no two days are the same. The graduate programme in place at Komatsu is fantastic as you get to sample every part of the business before deciding which area interests you the most or which area your skills are most suited. Maria, originally from Bulgaria but now living in Newcastle, graduated from Durham University’s Mechanical Engineering Degree in 2012 and has been with Komatsu since 2014. Maria said: “When I first applied for the job, I wasn’t really aware of what was produced at Birtley. I was obviously aware of the global standing of Komatsu and what it did, but was genuinely surprised at the size and scale of our operation. Komatsu’s two-year graduate programme provides new starters with five-months’ experience in each of the firm’s five main engineering departments: quality, planning, purchasing, design and production. “The Komatsu graduate programme is an excellent introduction to the company and, while I was drawn to quality, it was invaluable to have that experience of how the other areas of the business work,” added Stuart. Maria also spoke of the culture at Komatsu: “You are exposed to so much at Komatsu and quickly feel empowered, as there are constant opportunities to receive training to help you to improve your performance and progress, and both Stuart and I have recently started the company’s in-house Institute of Leadership and Management Programme”. 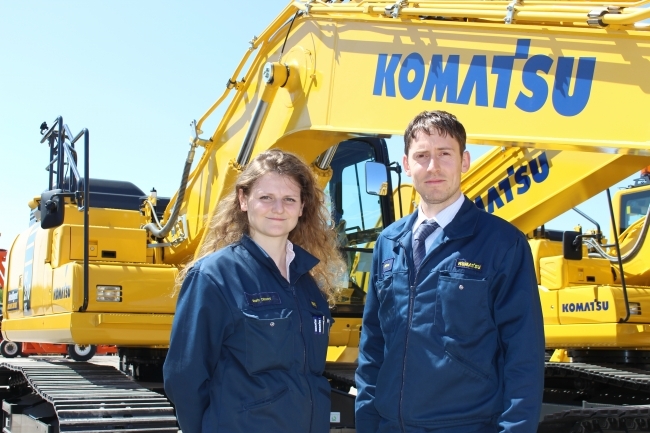 Tracey Bowman, Director of Human Recourses & Corporate Affairs at Komatsu, concluded: “Stuart and Maria have worked incredibly hard since arriving at Komatsu, progressing quickly from the graduate programme to now take on senior engineering roles – fantastic achievements and a testimony to their drive and capability. Komatsu last year celebrated the 30th anniversary of the opening of its Birtley plant. In a landmark year, the company launched three new machines, all of which are industry leaders in high reach, hybrid and intelligent machine technology. Komatsu UK employs almost 450 people and has recruited over 50 new employees in the last year, including apprentices, graduates, and production operators.